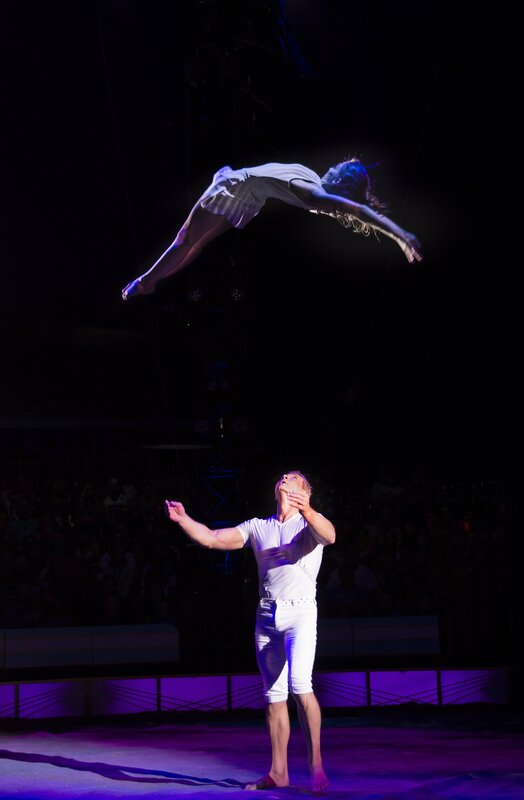 You are here: Home / Uncategorized / My Kids are Joining the Circus! My Kids are Joining the Circus! Disclosure: Press passes were provided free for review purposes, but the opinions are solely that of the writer. Every single person I told that I was going to see the circus asked me the same question “You’re going to the circus? Like, to protest?” It’s no secret that I have dedicated my life to animals and would never support any enterprise that harmed them. I never thought my children would have the experience of seeing a circus, because bull hooks being used on elephants or tigers being made to jump through fiery rings is not something I would want them to think was ok. 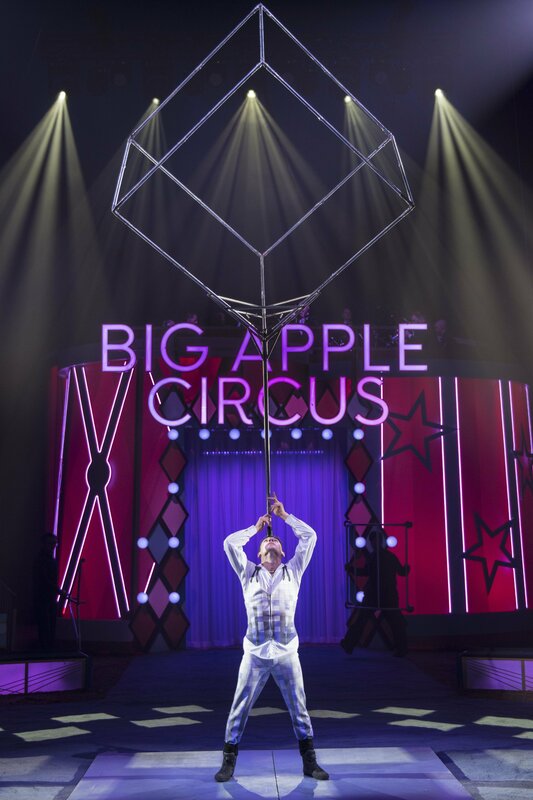 When the Big Apple Circus rolled into town and I learned that they have a strict policy against wild or exotic animal acts, I realized that we could actually go without it weighing on my conscience. I think the human- animal bond is fascinating as long as it isn’t at the expense of the animal. Animal Trainer Jenny Vidbel does an act with her rescued dogs and horses. One dog ran out and was so excited to see all the people she just kind of ran around wagging her tail at everyone and then took off again, clearly living her best life. When they aren’t traveling with her, they are enjoying her 100 acre farm in the Catskills. We headed under the big top and it was immediately a really fun atmosphere. There was a woman on stilts walking around and a man juggling. The smell of popcorn was in the air and the cotton candy machines were buzzing. The red and white striped tents were lit by carnival lights. We were glad we were there very early, so we could get snacks and use the bathrooms before finding our seats. 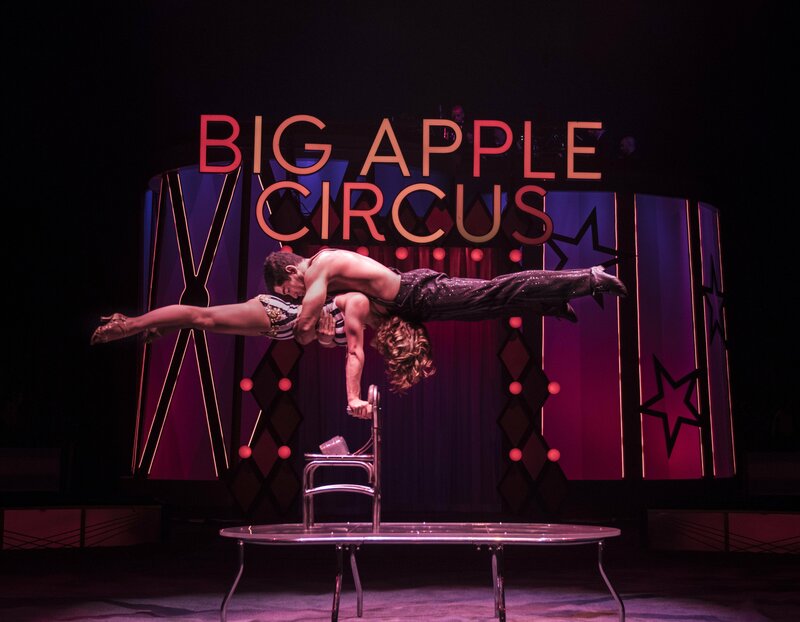 You really can’t get a bad seat at the Big Apple Circus. It is a pretty intimate setting and the furthest seat is 50 feet away. There was something else missing that made me really happy… scary clowns. I had already prepared the kids that if I saw a clown, we would have to evacuate immediately. 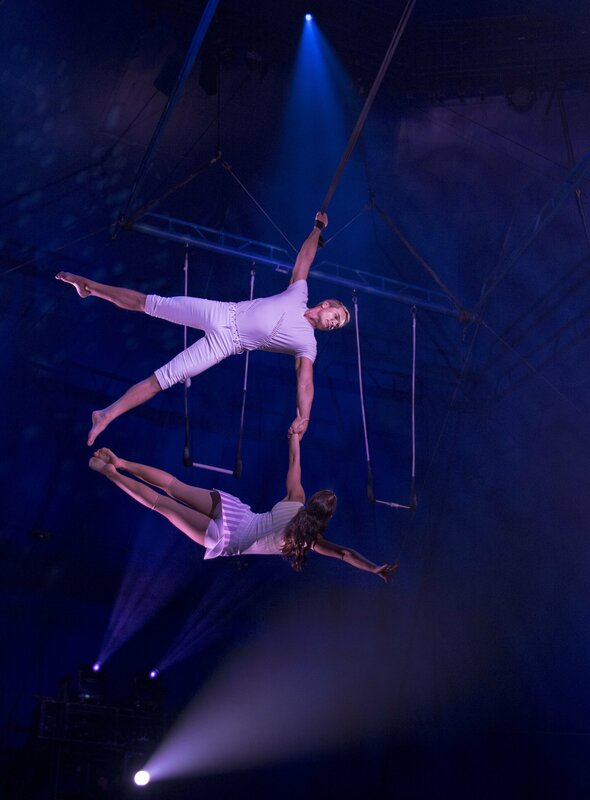 The two hour show flew by as we watched unbelievable contortionists, death defying balancing acts, and a flying trapeze act. My favorite part was the wall trampoline where acrobats would do these amazing jumps and then land perfectly in a seated position. They made it look so easy! The kids loved the trapeze and it was a thrill to watch a quadruple somersault. It made me realize how amazing humans are. These people were such talented gymnasts. During the Ariel Straps Show, a man dropped his partner and just as I thought she would plummet to her death, he caught her with his feet. My heart stopped completely. 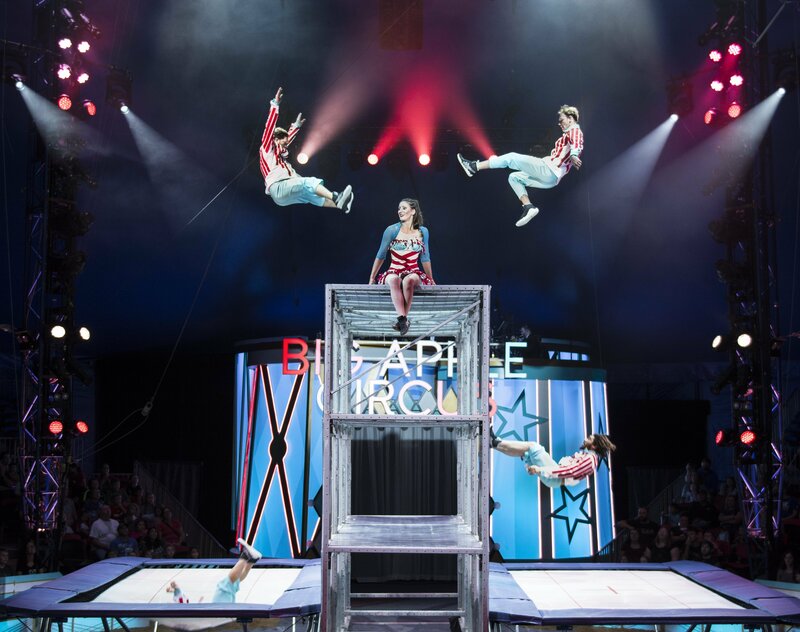 Some last feel-good facts about the Big Apple Circus are that they offer many outreach programs including Circus of the Senses (sensory-friendly performances) and Circus for All, which provides $10 tickets to underprivileged children. I also thought it was pretty cool to see all the female-led acts as well as a female ringmaster.